There has been much public controversy over the decision by PEN America to give its freedom of expression award to Charlie Hebdo. I was scathing about some of the critics of Charlie Hebdo in the immediate wake of the January massacre of its staff (I discussed the responses in an article in Free Inquiry - it's behind a pay wall for subscribers, however), so you might expect me to be equally scathing of the high-profile authors, such as Peter Carey, who are currently protesting PEN America's decision. Actually, no - I have a slightly more nuanced view this time. Part of what I was criticising in the Free Inquiry article was the sanctimonious attacks on Charlie Hebdo when the corpses of its murdered staff were scarcely cooled. Obviously, time has passed... and it is now a more reasonable moment for reflection on the magazine's content. The grant of an important award to it also makes this a time to reflect on the content of the magazine and for any fair criticisms to be expressed. As I said in Free Inquiry, if Charlie Hebdo were a clearly racist and vicious publication we would condemn the murders but not stand in solidarity with the magazine, for example by using the hashtag #JeSuiCharlie. We'd certainly we'd not, after all this time for consideration, support prestigious awards for it. There's at least a genuine controversy about exactly how supportive we - and organisations such as PEN - ought to be. Thus, I see this latest episode in a somewhat different light from the early smears against the magazine and the murder victims, some of which went close to saying that the victims had it coming (one or two authors didn't merely go close but pretty much said this straight out). We need to be able to make fair, reasonably nuanced distinctions ourselves if we're going to ask others to make them. None of the above should be taken as meaning that I support the authors who are protesting or that I am against PEN America's decision. It should only be taken as meaning that it's important to make distinctions that matter. By and large, what the protesting authors are now saying is more considered (and again, more timely) than the journalistic attacks that we saw back in January shortly after the Charlie Hebdo murders. But it remains the case, as I said back then, that much of the criticism has been (continues to be) opportunistic and decontextualized from French politics and culture. Some of it has been highly distasteful and intellectually dishonest, discouraging rather than assisting any fair search for what Charlie Hebdo's satire actually conveys to its sophisticated French audience. Even now, the opposition from Carey and the others seems to be based, at least in part, on a decontextualized understanding and an unfortunate degree of groupthink and tribalism. If we've now reached a point where serious critical discussion of Charlie Hebdo is fitting - and yet again, perhaps we have - we still need to make sure that, as I put it in the Free Inquiry article, "we ... strive to match the complexities of the cartoonists' wit with a complexity and generosity of response." I'm unconvinced that the current wave of high-profile critics are yet managing to do that. More generally, I remain concerned about the relentless scouring of novels, movies, comedy routines, cartoons, video games, and other cultural products for some kind of racist intent or implication that was probably neither intended as a take-home message nor communicated (intentionally or otherwise) to the original audience. There is also, in much literary and cultural criticism, a vulgar, philistine dismissal of complexity - as I put it (again) in Free Inquiry, "of nuance, irony, social and artistic context, and any complexity, ambiguity, or instability of meaning." This is not the way to treat art or its creators. It produces a pressure for safe, simplistic, fearful, conforming art. It's a Stalinist approach to culture. By all means, let's subject cultural products to intelligent, well-informed critique, which can involve multiple perspectives and sources of insight. But in doing so, please let's not lapse into being vulgar and predictable, or into the mere political tribalism that has become such an intrusive feature of current cultural debates. It looks at this point as if Avengers: Age of Ultron will turn out even bigger at the box office than The Avengers was. The new movie opened last week in numerous regions with a better overall showing than its predecessor, and will be opening in a couple of days in the US - where the predictions are for an even higher opening box office than last time. It should be huge in China, which seems to have discovered an insatiable appetite for Hollywood superhero movies. As I was back in 2012, I'm fascinated to see how this eventually pans out - so expect to see a bit of obsession from me over Age of Ultron for the next month or so. I was careful in my review of Age of Ultron last weekend not to include more than relatively minor spoilers: the review contains no revelations of major plot twists, consequences, and the like. I'll probably have a bit more to say about the movie when it's been around longer, though I'll still be careful not to give anything significant away without appropriate warning. Read on if you don't mind some relatively minor spoilers about Avengers: Age of Ultron. I won't be giving away any big surprises or major plot points, but nor can I promise to reveal nothing new about the content of the movie. So, the choice is yours! With that warning duly given, the first point to make is that Avengers: Age of Ultron hits all the notes. If I had a serious criticism of its predecessor, Marvel's The Avengers, it was a certain tameness or going through the motions - a lack of felt danger - in the climactic battle scene where the Avengers take on Loki and the Chitauri. Loki is given a pretty good showing in that scene, but the Chitauri do not seem like worthy opponents for the Avengers. They appear hopelessly incompetent. Things are very different in the equivalent scene in Age of Ultron. Once again, we are shown a climactic battle between the Avengers and a horde of enemies for them to smash - this time it's an army of robots animated by the malevolent artificial intelligence, Ultron. Once again, the good guys shine: we see what they can do when they truly unleash against their enemies. But the framing and handling of the scene are very different this time, building a sense of real danger. Unlike the Chitauri, Ultron appears truly intimidating, a genuine threat to the Avengers and the world, to the bitter end. A movie like this thrives by breathing life into extraordinary characters, making them seem plausible, outrageous as they are with their fantastic back stories and their superhuman powers (even superheroes who are presented as, fundamentally, merely human, such as the Black Widow and Hawkeye, possess fighting skills and other abilities beyond those we'd expect, in real life, of Olympic athletes). Age of Ultron is going to please fans because - as with The Avengers - it makes the characters live on the screen. It makes their powers seem real, and highlights their distinctive personalities and emotional drives, and, most notably, the fears that haunt them. It grants the heroes and the villains badass moments, never diminishes any of them, and is (usually) highly respectful of the source material. We are given some touching (in more ways than one) moments between the characters, and these are generally presented tactfully (though some viewers may find it a bit much when we're served up tender King Kong/Ann Darrow interactions between the Hulk and the Black Widow - oh well, they really didn't bother me, but they pushed the envelope of my tolerance just a little bit; with these scenes, your mileage may vary). We are also treated to plenty of humour. I laughed aloud several times, although the comedy depended, in some cases, on extensive background understanding of the Marvel universe. That's fine: it rewards the long-standing fans. The comic effect often depends on masculine competitiveness between the heroes - something that is gently mocked. At one point, Iron Man/Tony Stark even gets into a bragging match with Thor about the respective merits of their girlfriends, Pepper Potts and Jane Foster (it's refreshing, though, that the merits in question relate to the absent women's intellectual accomplishments, rather than their physical beauty). Age of Ultron could easily have been a technophobic movie, based as it is on the creation of a powerful and inimical artificial intelligence. To my relief, it doesn't play like that. I owe the media critic J.P. Telotte the insight that seemingly technophobic science fiction tends to find a place within its value set for the technology that it simultaneously presents as frightening. Age of Ultron is a fairly extreme example, since the general direction is far more technophilic than technophobic. The technophobia/technophilia theme comes to the surface - it is made explicit - at one point in a debate between Tony Stark and Bruce Banner. Stark acknowledges that they are, from others' viewpoints, mad scientists, but he insists they must use their superscience skills to help the world and correct their own mistakes. At times, Age of Ultron moves so quickly that the action becomes confusing. Some choices in its final editing may have been less than perfect for plot clarity, though the solution is probably to watch the movie again. Overall, it delivers - better, I think, than its predecessor. In particular, fans of this franchise or of Marvel Comics will not be disappointed. 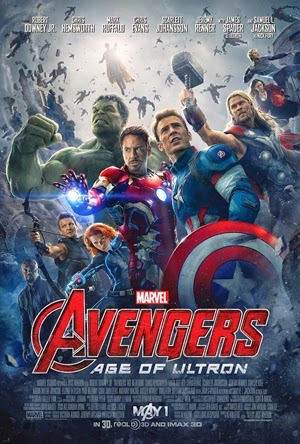 In preparation for seeing Avengers: Age of Ultron, I watched the movie again a couple of nights ago, and I now tend to think I was a little too harsh when I originally reviewed it - perhaps my expectations or hopes were too high at the time. Watching it again, I still thought the closing battle was somewhat anti-climactic, as the Chitauri were just so incompetent. It never felt (to me) that they were a real threat to the good guys. Consequently, that battle scene became (to my taste) too much a showcase for what the individual Avengers could do, when pitted against a vast alien army, and not an emotionally convincing case of bravery and resourcefulness overcoming the odds. This is despite the fact that the Chitauri keep coming in seemingly limitless numbers. So, that criticism remains. Of course, it depends on what you want. If you basically want to cheer for the heroic characters - or your favourites among them - as they cut loose on a faceless enemy horde, then this won't be much of a criticism. I remain impressed by the way all the main characters were built up, shown as badass, and (at least in most cases) kept close to the original source material. Most of the performances were excellent - e.g. I was much more struck this time by Mark Ruffalo's performance as a somewhat skulking, enigmatic Bruce Banner. Loki's confrontations with the individual heroes were impressive, done in a way that provides good showings for each of them but also for him as the villain (even when he gets smashed around by the Hulk near the end, he is shown soon after picking himself up almost unscathed and declaring that he could really do with that drink Tony Stark offered him at the start of the battle). Good, fun stuff - and I'll report back soon on Age of Ultron. As I've previously mentioned, I signed up in recent months to write a book for the academic publisher Springer on, basically, the topic of science fiction and moral philosophy. That will include discussing many books, stories, movies, TV series, comics, etc., from a point of view grounded in a knowledge of moral philosophy (though also grounded in my knowledge of the genre and my skills/training as a literary critic). Like all my projects, this one will require some rigorous, difficult thinking. I don't expect it to be at all easy to deliver a manuscript at the standard I aim for. There will be ups and downs. Let's face it, though, the research is going to be a lot of fun! I'll be reading more works of prose fiction, watching more movies and TV episodes, etc., than is normally the case for me in recent years, and I'll be able to use this blog as my sandbox as I get some initial thoughts down about what I want to say. I also expect to write here about much material that won't end up being discussed in the book, since I'll need to cast my net widely to sort out just which works actually will be discussed there. This is going to be a great year for geeks in the sense that we can look forward to many high-profile SF (and related) movies, among them new instalments from the Star Wars, Jurassic Park, Avengers, Mad Max, and Terminator franchises. The last of these is especially dear to my heart, as I once wrote some tie-in novels for the world of the first two Terminator movies... but all of them are going to be worth seeing. I plan to review them all here, along with much else that I'll be reading, re-reading, watching, re-watching, and so forth. I'm planning to take this blog back more to its original conception. As a first step, I've restored its original title "Metamagician and the Hellfire Club". One change I'm making from the original conception, though, is that I'm disabling comments. I've been scratching my head on and off for a few years now about this blog. At one point it was quite popular, though by that stage it had moved away from its original purpose. It then needed to be a lot more popular to suit its changing role, and that never really happened. I think I was happiest with it when it was just my weblog and sandpit. So that's the direction it will move in. By and large, the discussions here were always civil, thoughtful, and useful. All the same, moderating can take a lot of time and energy, which I've decided I don't have left over from other projects. So I'm more likely to write stuff here - perhaps even some interesting stuff that a few people might want to read - if I don't have to worry about providing yet another discussion forum on the internet. More to come about this! I've been given the green light from Palgrave Pivot for a small academic monograph with the working title: The Mystery of Moral Authority. I'm jumping the gun slightly in announcing this, but I hope to sign a formal contract in the next few days quite soon. I already have a good draft of the manuscript, but I'll be putting in some more work to meet the publisher's formal requirements (house style, etc. ), get it down to 45,000 words, and generally make sure I'm happy with it. If all goes well, expect to see the book published (primarily as an e-book, but with print on demand available) in about six months. I'm excited, of course. Palgrave Pivot is a quality publisher - actually a specialist academic imprint of Palgrave Macmillan, which is part, in turn, of the large Macmillan Group. At the same time, a small book of this sort will enable me to set out my views on some fundamental issues in moral philosophy in a way that's concise and to the point, but still allows room to develop some detailed arguments. I'll be attempting to do justice to a range of philosophical views, while criticising them. These will include some that are often dismissed quickly: my approach is to look at the strongest versions of, say, moral relativism, I can find, attempting to identify what their attraction might be and what grains of truth they might contain. Often I see writers attack vulgar or weak versions of philosophical theories that they dislike, which does little for intellectual progress (or even for conveying what serious theories are on offer). The Mystery of Moral Authority will also serve as a manifesto for my own positive account of morality and moral philosophy. Don't expect me to spell that out here (if I could do so in a blog post, I wouldn't need to write a book!). Still, to give a hint of the direction, the manuscript currently states that moral error theorists are the closest thing to my "tribe" among proponents of various contemporary approaches to metaethics.